Tomorrow B and I are having friends over to watch the Super Bowl. While we have the food and appetizers planned, I wasn’t sure what we were going to do for dessert. I thought about Football Brownies or Cheeseburger Cupcakes, but wanted to try something new. 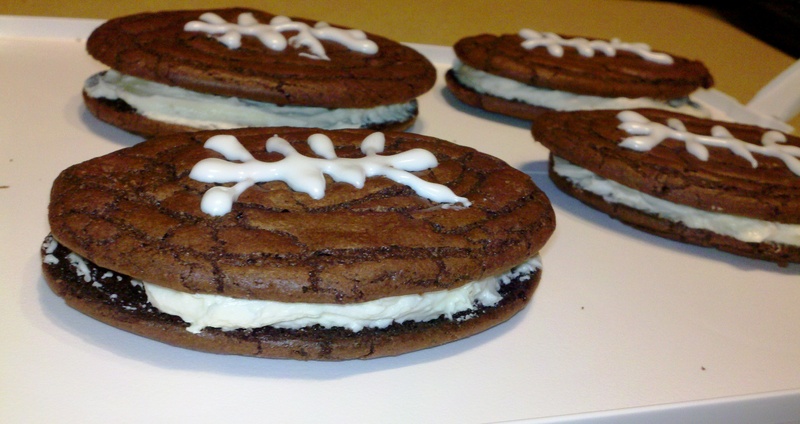 Then, I came across this recipe for what the blogger called “Football Whoopie Pies” – while I don’t consider them actual whoopie pies, they still looked perfect for the big game. Below, the recipe, borrowed with minimal changes, from Created By Diane. Mix together ingredients for brownie batter according to package, WITHOUT the water. If your brownie box has options for “fudgelike” brownies v. “cakelike” follow directions for “fudgelike.” Place brownie batter in a piping bag, and cut a small slit at the end of the bag. Create a football-shaped stencil, or use a cookie cutter. Draw the outline of footballs on parchment paper. Be sure to leave space between each football so that the footballs don’t run into one another – they will spread some when baking. Line cookie sheets with the parchment paper. Pipe the brownie mix to fill in the football shapes (see photo). Bake brownies at 350 for 12-15 minutes. Since they are thin, watch to make sure they don’t burn – mine were done at exactly 12 minutes. Mine made 18 brownie footballs, or 9 sandwiches. Add vanilla and milk and continue to mix until well mixed. Once cooled, decorate half of the footballs. Use the cookie icing to draw laces on half the brownie footballs. These will be the top of the sandwiches. Top the remaining footballs with 2 heaping tablespoons of the buttercream. Spread evenly and top with the laced sandwich half.